Hombre - a solid western starring Paul Newman. 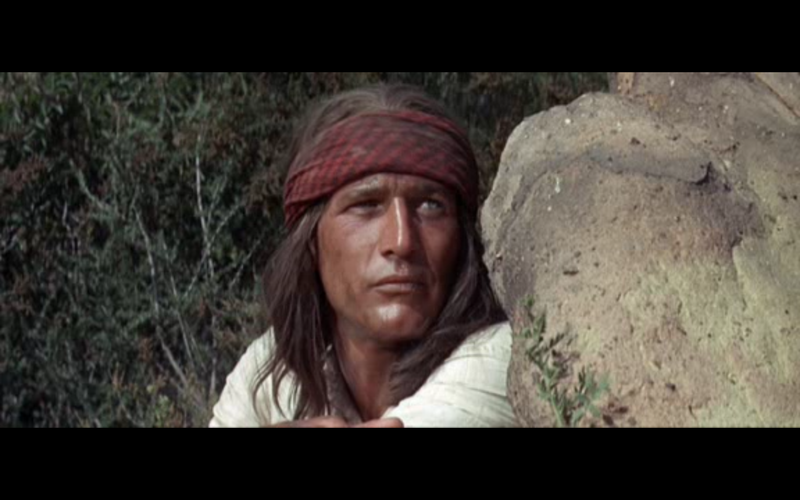 He plays John Russell, a white man raised by the Apache since childhood on a reservation. The plot is fairly simple, Russell escorts a group of people on a coach wagon to another town and in the process they are held up by bandits. This film does not sugarcoat frontier life and we are told of the cruel and unfair plight of the Native Americans and witness acts of racism against them. At one point on the coach trip Russell is told to sit on top (with the other minority, a Mexican character) due to the protests of Mrs. Favor (played by the gorgeous Barbara Rush), she doesn't want such a "savage" man in the coach with the civilized white folk. Ironically, later on Russell sacrifices his own life to save her from the bandits, when even her own husband is afraid to act on her behalf. A major theme of the film is greed. It drives a disillusioned town sheriff to join the bandits. The West is accurately portrayed as a harsh and unforgiving environment.